There is nothing more rewarding than an enjoyable day on the boat, especially if that day is trouble-free. It doesn’t happen all the time but if you have a good understanding of your electrical system and spend the time to perform regular maintenance then the trouble days will be few and far between. When your boat was shipped from the factory, the systems were designed to be safe and reliable. Over the years, trades and owners have modified the electrical system to add more and more creature comforts. These upgrades do not necessarily follow marine industry standards and, in many cases, are a “make-it-work” versus “doing-it-right” project. For peace of mind boating, it’s essential that boat-owners review the electrical system for any deficiencies that might affect the safety and reliability of the vessel. 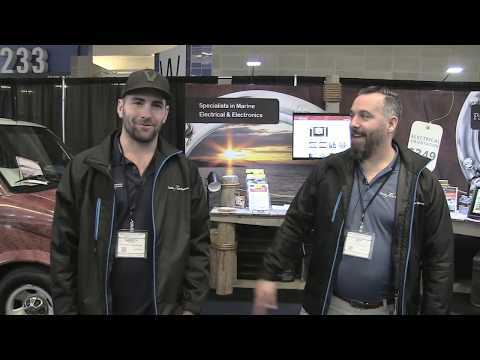 This gave us an idea and ten years ago we started performing Electrical Audits for boats. 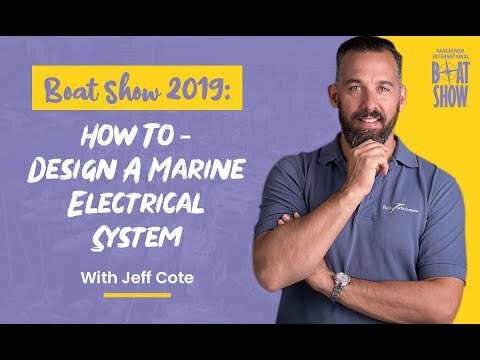 An ABYC Certified Marine Electrical Technician would review the boat’s main electrical system, focusing on the battery setup, wiring and fusing, DC switching, charger, inverter, alternator, and AC main panel. This served as a great tool for boat owners to see exactly what they were working with and to make a plan to move forward. We have performed well over 1,500 electrical audits and we thought we would share the most common electrical deficiencies we see. Battery Bank. A battery box is designed to secure the batteries, however if you have flooded lead acid (FLA) batteries the main purpose of the battery box is to also contain any spilled or boiled over battery acid from the vent caps. It may look like you simply have spilled water on the top of your batteries but, in most cases, this liquid is sulphuric acid which can destroy porous materials such as wood and even metal. A proper battery box should be made of plastic with no fasteners, such a screws, through the bottom of the box. It should be a totally leak-proof battery box. If you see liquid around your batteries, assume it is battery acid. If unattended for months, spilled battery acid can cause expensive damage to many components. To clean it up, first protect yourself with gloves, goggles, and proper ventilation. Dilute the acid with water, and then put baking soda on it to neutralize the acid. However, never put baking soda near the battery caps—if it gets inside the battery, it will neutralize part of the acid inside the battery. This leaking acid, as well as being a problem in itself, is a sign that your batteries are possibly being overcharged or overfilled, so the cause should be investigated. 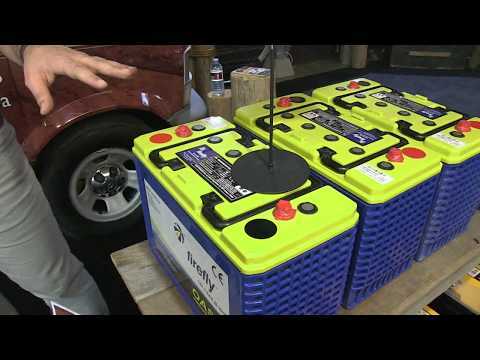 There are two distinct types of flooded batteries on boats, a starter battery or a deep cycle house battery. Although they look identical from the outside, a starter battery has the largest plate surface area allowing for rapid high amperage discharge typical of an engine starting. Ensure that you are not using a starting FLA battery for deep cycle applications such as your house bank. Using a starter FLA battery in a deep cycle application will overtime, damage the battery and, on rare occasions, cause it to explode while it is being recharged. All batteries need to have a master on/off disconnect switch. This allows you to disconnect the batteries for servicing. More importantly, in the event of an electrical fire, you can disconnect the battery from any circuit. Effectively, the battery switch acts like a fuel shut-off valve. To maximize the energy available to your DC loads, reduce any corrosion by only using tinned, close-ended lugs with heat-shrink at the batteries terminals. Make sure the heat-shrink tubing over the battery cable is two inches long and that the heat-shrink is tight on the cable. 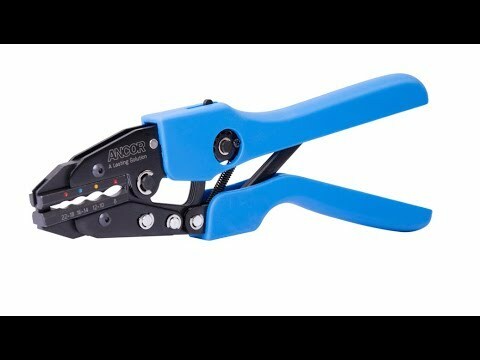 Effectively you don’t want any moisture reaching the wire strands within the cable causing corrosion. [TIP] If you have FLA batteries, make sure there is no sign of battery acid on top of the battery itself or in the box. With age, a battery will have more resistance to charging and this will cause the electrolyte temperature to rise and potentially boil some battery acid outside via the battery vent caps. With signs of battery acid outside the battery, you might want to reduce the charge rate (charger, external regulator or alternator) of the batteries. Battery Charger. One of the first mistakes we see with battery charger installations is that the charger is not set to the correct lead acid battery profile such as flooded, AGM or gel. All lead acid batteries need to be charged at the correct voltages to maximize their service life. Having the wrong charger profile will shorten the life of the battery. Ensure that you have a three-stage charger, also called a smart charger. They are easy to use, worry free, won’t overcharge your batteries and you can leave them on 24/7. Smart chargers detect voltage and resistance from the battery before they start charging and then determine which stage to charge, bulk, absorption or float. Smart chargers also come with battery temperature sensors so that the batteries are charged at the right voltage for the battery temperature. For safety, the charger leads should be fused at the battery with a rating of 1.25 of the charger output and must have a chassis ground connected. For instance, a 40 amp charger should have 50 amp rated fuses located at the battery side of the charger circuit. Also, make sure that the battery charger wire size can handle the current output from the charger. We commonly see upgraded chargers where the charger wire was not upsized to handle the new larger charger output. Make sure your battery charger is sized properly. The general rule of thumb is that the charge rate should be at least ten percent of the total amp hour capacity of the battery bank. For instance, a 400Ah battery bank would require a 40A charger. If you do not size the charger correctly your batteries will age prematurely due to undercharging at bulk. Inverter. The installation manual for a standard inverter is more than 75 pages long and makes for some dry reading however, this is one area that we see the most DIY installation mistakes. First up, no inverter is ignition protected and, therefore, an inverter cannot be installed in a gasoline engine room. The inverter must be installed in a space where no gasoline vapors can reach. It is common to see a large hole drilled between a gasoline engine room and the cabin to allow battery cables to be routed. Unfortunately, this hole is rarely properly sealed and allows gasoline vapors to enter the inverter compartment which can cause an explosion if there is a gasoline leak in the engine room. Secondly, the inverter must have a master DC on/off battery switch on the positive cable from the battery to the inverter. As well as a fuse that can protect both the inverter and the cable to the inverter, installed right beside the battery. And the third most common mistake we see on inverter installations is that they are mounted with too small of a battery cable. The wire size feeding the inverter is a function of the inverter wattage and the cable distance between the inverter and the battery. Double-check the length of the cable to and from the inverter to the battery bank and, while looking in the installation manual, confirm you are using the correct gauge of battery cable. 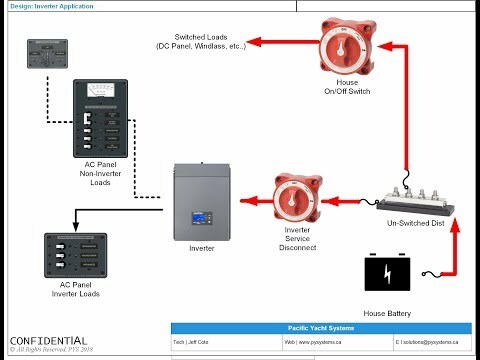 AC Panel. Although most boats have the AC panel on the same side as the AC shore power inlet, some do not. Make sure you have a double-pole breaker on the Main AC circuit within 10 feet of the AC shore power inlet. Double-pole breakers allow both the AC hot and AC neutral wire to be disconnected simultaneously. That means if there is a short circuit on either wire, both trip. At this time year, we see a lot of blackened shore power cords. If you keep a heater on constantly through the colder months there is a heavy strain on your AC electrical system. Your shore-side connection must be connected securely, and be free of dirt and corrosion. At full output, a typical ceramic heater draws approximately 12 amps. Therefore, it takes only two heaters to almost max out your 30 amp shore-side receptacle. In comparison, during the warmer months most boats rarely exceed a 5-10 amp draw from their appliances (such as a battery charger), the difference is substantial. With such a high draw from your heaters, your AC shore-side receptacle needs to be in good condition so it can sustain the high current rate. With high current and a poor connection, overheating is quite likely, and this will cause a “snowball effect.” As heat increases, so does resistance, resulting in more overheating. Most boat fires do not start with flames but with heat, a bad connection can easily lead to a dangerous situation. Always inspect the shore power inlet and look for any signs of discoloration or corrosion, be extra vigilant this time of year and replace the outlet and the cord as needed. In this day and age of information transparency, it is much easier to learn from others' mistakes. Ask for advice, look to professionals who specialize, and don't take chances with your boat's electrical.